Brand: CK Products 75-2853 Units: 12 oz. bag Delicious chunks of coconut hard candy crunch ready to add to your favorite cookie, candy and other treats. It is also great on top of ice cream! Easy candy recipe: Melt 2 pounds of cocoa lite (70-2100) or cocoa dark (70-2150). Stir in 1 bag of crunch. Spread on waxed paper and allow to set. When set, break apart and eat! 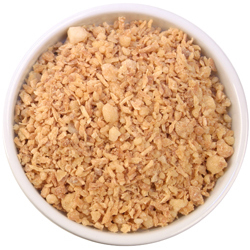 Delicious chunks of coconut hard candy crunch ready to add to your favorite cookie, candy and other treats. It is also great on top of ice cream! Easy candy recipe: Melt 2 pounds of cocoa lite (70-2100) or cocoa dark (70-2150). Stir in 1 bag of crunch. Spread on waxed paper and allow to set. When set, break apart and eat!